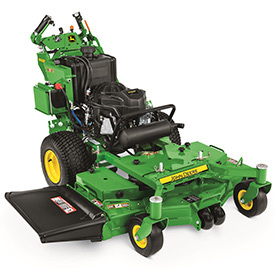 The John Deere R Series Commercial Walk Behind Mowers are designed to enhance operator productivity and comfort. The four models—W36R, W48R, W52R and W61R—feature redesigned controls with improved hand position and control grips with recessed operator presence levers. Improved weight distribution and hand control position makes it easier to raise the front end of the mower during curb-climbing applications. The electric start R Series line provides ground speed of up to seven and half miles per hour. The R Series models offer up to eight and half inches of ground clearance, minimizing damage to account properties and product.